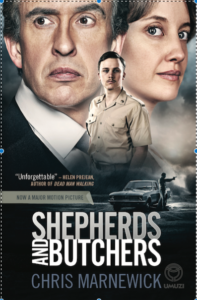 Well-known producers Brian Cox and Anant Singh produced Shepherds & Butchers that has been directed by Oliver Schmitz. Actor Steve Coogan has been cast in the role of lawyer Johan Weber. Leon Labuschagne’s livelihood depends on death. At nineteen, he is a warder on Death Row: a shepherd who cares for the condemned – and a butcher who escorts them to the gallows. After a gruelling two-week stint in which thirty-two men were hanged, Leon loses control, with tragic results. And now he’s the one facing the death penalty. A gripping courtroom drama steeped in the factual. This novel portrays legal execution in unprecedented detail, revealing its devastating impact on all those involved.